Michael Nielsen started performing on the ukulele at the age of four and professionally on guitar at the age of 12. Teaching has always been part of his musical interest since his early teens. 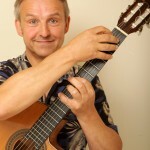 He gained an LTCL in classical guitar performance and MPhil in physics and microtonal music involving the design of unique microtonal guitars. His MPhil work will be featured in the second edition of The Contemporary Guitar (2014) by Californian microtonal guitarist and broadcaster, John Schneider. From 1983-85 Mike attended Berklee College of Music, Boston receiving a scholarship and Jim Hall Incentive award. Recently he was awarded the Vice-Chancellor Scholarship to study for PhD at the University of Ulster. The study involves microtonal composition, improvisation and performance. Mike is the founder and director of the Masters in Jazz Performance Program at the Dublin Institute of Technology of Music and conducts the big band. He is also the ensemble director, tutor and one of Ireland’s representative performers during the annual international jazz summer school, the Sligo Jazz Project. As a jazz guitarist he performed with many international artists including Dave Liebman (previously with Miles Davis) with whom he has toured Europe, Australia and New Zealand and recorded twice. As a solo guitarist he performed on the same bill as the legendary guitarist John McLaughlin during his first visit to Dublin and before the Elvin Jones Band at the ESB Dublin Jazz Festival. Mike also specializes in odd-meter performance and has toured Europe and U.S. teaching and performing. His book on rhythm will be published by Schott Publishers, Germany in 2014. He has received many Arts Council, Improvised Music Company and Music Network performance, project, touring and travel awards. As a composer he was commissioned to write music for the Kilkenny Arts Festival which was recorded for Lyric FM; the University of Ulster; IMC and Temple Bar Properties among others and writes music ranging from solo guitar to big band. Mike has featured as soloist with the Concert Orchestra on three occasions including two premiers of works by Ronan Guilfoyle and recently played in the National Concert Hall at a tribute to Noel Kelehan. He features in the Encyclopedia of Ireland.